The fewest points lost in a singles match this week, men’s or women’s, came at the Uber Cup group stage when Korean no.1 Sung Ji Hyun beat Australian Tara Pilven 21-3 21-8. Two hours later, Sung’s teammate Lee Min Ji outplayed her fellow third singles Joy Lai and allowed also 11 points with a 21-8 21-3 scoreline. (Record of the fewest points lost in a doubles match was also made in the same tie, as Ko A Ra/Yoo Hae Won finished their match in 20 minutes, demolishing the Australian opponents 21-4 21-6.) Korea finally picked up the bronze medal. 2010 winner Korea won the bronze, falling to the eventual champion China in the semifinals. World no.1 Li Xuerui dominated her opponents on China’s way to the Uber Cup crown. She did not let go of one game in six matches and the longest day at office took just 39 minutes against Korean Sung Ji Hyun in the semifinals. Li was honored on Friday evening as the BWF Female Player of the Year 2013. Lee Yong Dae and Yoo Yeon Seong had not lost a game from their three previous meetings but the 4-month break from the tour proved to be a factor as they lost to Indonesian Mohammad Ahsan/Hendra Setiawan in a nail-biting 15-21 21-17 19-21 battle in the quarters. 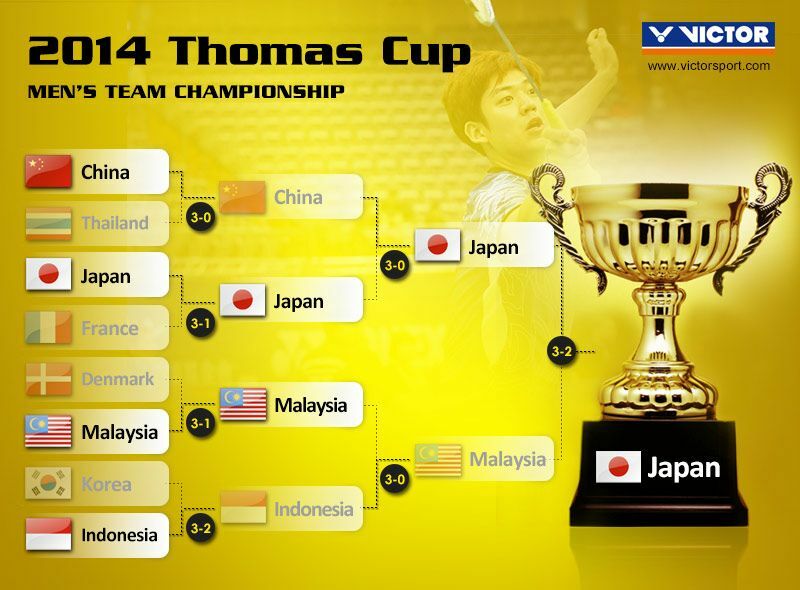 Korea ultimately fell to the 13-time champ in the deciding fifth point. Lee Yong Dae and Yoo Yeon Seong reunited after 4 months of absence. Ashwini Ponnappa's only loss came in the semifinals, helped India win its first medal. Despite being behind 32 places in the rankings, Indian Ashiwnini Ponnappa and partner Jwala Gutta fought from a game down and was poised to carry India to first Uber Cup final after taking the second 22-20 and led 9-5 in the decider in the third tie of the semifinals. However, they eventually suffered their first and only loss of this year’s competition to Japan’s 4th-ranked Misaki Matsutomo/Ayaka Takahashi and gave Japan a turn-around victory.